If you like Reformed books–and if you follow this blog, you probably do–then you may enjoy following the other blog that’s been dominating all of my blogging energy for the past few months. A deacon at my church asked me to take over our church library when we moved into our new building. More recently, we discussed putting the collection online for the use of members of our church who patronize our library to see what we have, and to serve as a resource to discuss, ask questions, review, recommend or criticize our titles. We thought about a few options, but I settled on using a blog for this purpose, given my nine years of experience at blogging. 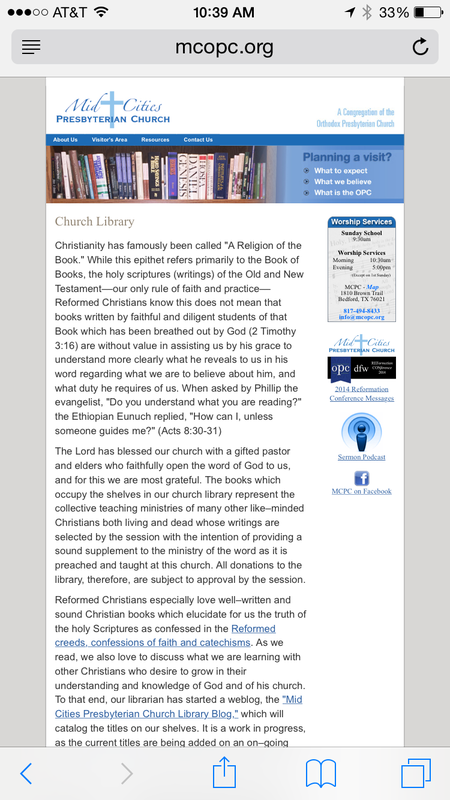 First, you may enjoy reading my introduction to our church library which is posted at my church website. It will then link you to my library blog, Mid-Cities Presbyterian Church Library Blog (or more commonly, MCOPC Library). Even though you are not a member of my church, please feel free to subscribe and comment as you like. Thanks for your interest!